Last Friday, a group of 27 Ohio House Democrats, led by House Minority Leader Fred Strahorn, sent a letter to AT&T Ohio President Adam Grzybicki calling on the company to bargain a fair contract with CWA members at AT&T Midwest and AT&T Legacy T that addresses job security and the return of offshored and outsourced work. A similar letter was sent earlier in July by Ohio State Senate minority leader Kenny Yuko, along with all of the Democratic members of the Ohio State Senate. "CWA Midwest and Legacy T workers want a fair contract that returns offshored or outsourced work and addresses employment security and the long term economic stability of the company, its employees and our state. We encourage AT&T to continue to work toward an appropriate resolution that is fair to Ohio workers and enhances AT&T's long-term viability," the Representatives wrote. Read the full letter here. CWA also expanded a wave of radio ads to raise awareness of AT&T's broken promise to use a portion of its $20 billion tax break to create jobs and to ask members of Congress who voted for AT&T's $20 billion tax break to hold the company accountable, ramping up ads in Ohio, Illinois, and Colorado. Listen to the ads here. CWAers at AT&T Legacy T and AT&T Midwest including members of Locals 3603 (left) and 7906 (right) are fighting for a fair contract. CWA members ratified a new agreement to extend existing contracts with Frontier Communications in California through September 2020. The ratified agreement provides 2,700 CWA members who work at Frontier in California with pay increases, improvements in job security, and more. Tom Runnion, Vice President of CWA District 9, said, "We have reached an agreement that is in the best interests of telecommunications workers and will also strengthen Frontier as we move forward in this continuing partnership. Our experienced and trained CWA members will continue to provide Frontier's customers with the quality service they expect and deserve." Check out these CWAers in Ohio who teamed up to speak truth to power! In a short film called "Us vs. Them," CWA members talk about how working people must fight every day to push back on the lies that the 1-percent and corporate interests tell to keep us divided. This year's midterm elections are crucial for working families. The film highlights the work Senator Sherrod Brown has done as a proven champion for working people. Senator Brown stood with us during our fight against the TPP – the bad corporate trade deal that sought to offshore hundreds of thousands of good-paying American jobs, co-sponsored call center legislation in the U.S. Senate to keep our jobs here in the U.S., and has supported CWA members through our tough contract negotiations with companies like AT&T and American Airlines subsidiaries Piedmont and Envoy. The Facebook Premiere of the full version of the film will drop on Sunday, August 5, 2018. Click here to watch the exclusive sneak peek of the video. Click here to sign up to volunteer with the CWA Political Program in your area in this critical moment. CWA activists in Missouri having been working hard to defeat a so-called "right-to-work" ballot initiative called Proposition A that would be extremely harmful for working people. Election Day is Tuesday, August 7. CWA activists from District 6 have been knocking on doors and making phone calls, collecting hundreds of postcards with commitments from CWA members to vote against the initiative and engage others in the fight, and much more. This campaign to defeat Proposition A is supported by CWA's Missouri Right-to-Work Strategic Industry Fund. CWA activists in Missouri having been working hard to defeat a so-called "right-to-work" ballot initiative called Proposition A that would be extremely harmful for working people. Many airline passengers have suffered from uncomfortable temperatures on airplanes, often sweltering on the ground and then shivering in the air. Now they can help build the case for establishing rules to keep airplane temperatures within reasonable limits. A new mobile app from AFA-CWA – called 2Hot2Cold – allows passengers and flight crews to document and report extreme temperatures in aircraft cabins. The problem is especially acute for flight crews who regularly experience temperature extremes that would not be tolerated in other workplaces. Excessive heat can cause everything from fatigue and dizziness to heat exhaustion and heat stroke, and it can impair Flight Attendants' ability to perform critical safety and security duties. This month, AFA-CWA formally petitioned the Department of Transportation to issue rules to limit temperature extremes on flights. As the petition states, "there are currently no operational temperature standards that apply to the actual airplane environment for passengers and crews." AFA-CWA is recommending the adoption of a standard that would set a target temperature range inflight and on the ground of 65-75°F, with a maximum allowed temperature of 80°F inflight and on the ground. Several well-publicized incidents dramatically underscore the severity of the problem. In June 2017, an infant overheated and became non-responsive when a plane sat on a Denver tarmac. The baby was rushed by ambulance to a hospital for treatment. In 2013, several passengers forced to sit in the heat of Las Vegas fell ill, and 150 passengers suffered without air conditioning for two and a half hours on a plane in Phoenix. "The 2Hot2Cold app gives a voice to passengers," said AFA-CWA President Sara Nelson. "It's a constructive way for them and Flight Attendants to express their discomfort and provide concrete evidence to bolster our efforts to secure reasonable temperatures on planes." The app can be downloaded at: App Store (iPhone/iPad) or Play Store (Android). At a press event at Ronald Reagan Washington National Airport, AFA-CWA President Sara Nelson (fifth from left) announced the roll-out of a new mobile app called 2Hot2Cold allowing passengers and flight crews to document and report extreme temperatures in aircraft cabins. Hudson Valley CWAers are ready to take on the 2018 Midterm Elections! CWA members gathered to map out paths to victory in several key campaigns including James Skoufis, Jen Metzger, and Karen Smythe for State Senate and Antonio Delgado for Congress. Is your CWA Local hosting canvasses, phonebanks, or other election mobilization activities? 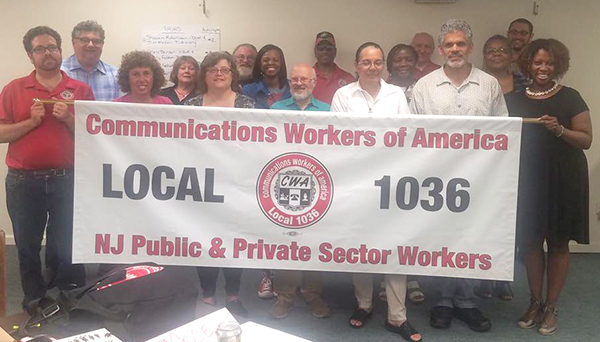 Send us your pictures – with a short explanation including approximately when, where, and who is in the photo at news@cwa-union.org so we can feature them in a future eNewsletter! One of CWA members' top priorities is working together to protect health and safety on the job. 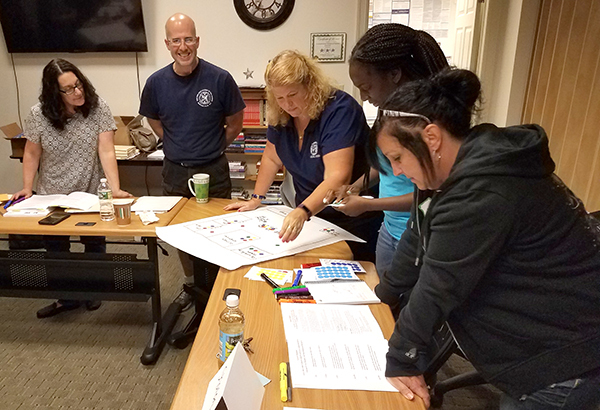 CWAers across the country have been participating in health and safety trainings in 2018, including recent sessions in New York and Texas. At the trainings, CWA members discussed the causes of injury, illness, and stress in the workplace, made plans to address health and safety issues at the local level, and much more. 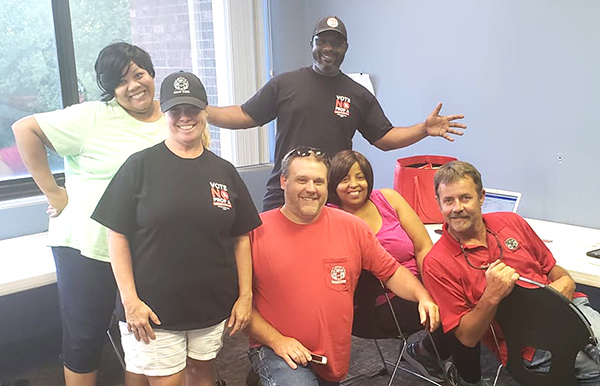 Above: At a July health and safety training session in Buffalo, members of CWA Locals 1133, 1122, and PPMWS-CWA Local 14148 from Verizon, New Era Cap, American Red Cross, Mercy Hospital, and Kaleida Health discussed ways to engage their co-workers on organizing for safer working conditions. Below: Members of CWA Local 6143 in San Antonio, Texas, attended a health and safety training in February. CWA Local 1036 stewards and activists in New Jersey gathered for a CWA Reversing Runaway Inequality training over the weekend. Workshop attendees spent the day digging into the roots of income inequality in the U.S. and strategizing about how to fight back.